Hier ist eine Karte,die ich noch nicht gezeigt habe. Sie war fÃƒÆ’Ã‚Â¼r meine Ex-Kollegin, die letzte Woche ihr 20-jÃƒÆ’Ã‚Â¤hriges JubilÃƒÆ’Ã‚Â¤um im BÃƒÆ’Ã‚Â¼ro feierte. Immerhin 13 Jahre davon, habe ich mit ihr zusammengearbeitet und zwar sehr gerne! This is a card I haven’t shown so far. It was for my ex collegue who had her 20years work anniversary last week. I shared 13 of those years with here – and I love working with her! Auf der Karte findet man mein derzeitiges Lieblingspapier – IOD-von Prima – ich bin hin und weg- schon seit Wochen. Und dann erhalte ich gestern von einer der beiden Designerinnen dieser Papiere, Sally eine Email, dass sie wiederum meine Galerie total mag und, dass sie gerne einige meiner Layouts auf dem IOD-Blog zeigen wollte. Vielen Dank Sally, ich habe mich so unglaublich gefreut! 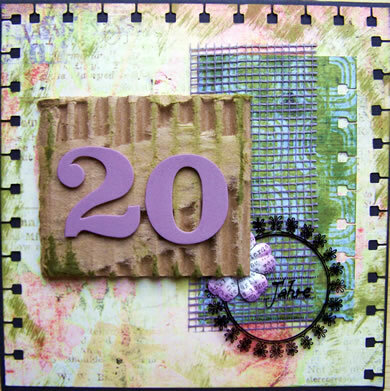 You find my favorite paper at the moment on this card – IOD by Prima! I’m totally in love with those papers – for weeks now. And then I got an email yesterday by Sally – who is one of the two Designers of those papers, telling me that she like my work in general and that she would like to show some of my layouts on the IOD-Blog. Thank you so much, Sally, I’m so happy about this! LOVE, LOVE, LOVE IT! I LOVE all the different textures & colors you’ve got going on here! AWESOME! GREAT JOB! That is such a pretty card! I totally love your style. HIer gibt es aber auch immer was neues – einfach klasse. Gratuliere! Die Karte gefÃƒÆ’Ã‚Â¤llt mir sehr gut. This is soo soo cool! Congrats! You are such a great talent darling! GlÃƒÆ’Ã‚Â¼ckwunsch!!! :D Das Papier passt aber auch sowas von gut zu Dir! Die Karte ist klasse, da hat sich Deine Kollegin bestimmt riesig gefreut! WÃƒÆ’Ã‚Â¼nsche Dir ein schÃƒÆ’Ã‚Â¶nes Wochenende! Love the card! Love how you used hambly and the punh for the sides! so cool! Congratz on featuring on the IOD blog!